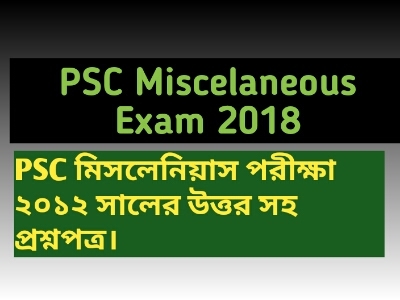 Hurry up, download West Bengal Public Service Commission Miscelaneous Exam Study materials. PSC Recently announced, various post of vacancy. After a long time PSC Miscelaneous Exam held on 2018. So This news is very important for West Bengal Students. Today GK Solve share PSC Miscelaneous Exam 2012 question paper with answer pdf download link. You can download easily this pdf book. Miscelaneous Exam 2018 is coming soon. So You need to start practice right now. Previous Year question paper is the most important paper for any kind of competitive Exam. So You shoud must download this Miscelaneous 2012 exam question paper with answer. This is fully Solved question paper. So all the candidates should must download this paper.